Growing Indoors is Not an Easy Task, You Need to Get Some Experience before Starting Indoor Gardening. We have a Complete Beginners Guide……. 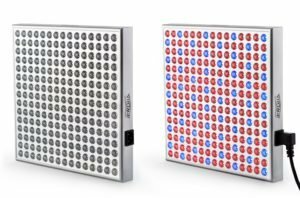 Read More to know Everything about LED GROW LIGHT,…their Efficiency….What types of light You Need? In this article, you will get all your answers related to LED grow lights in Canada. There are numbers of growing lights available in the market but all are not effective and affordable. Today we will discuss some of the affordable and best led grow lights for indoor growers. Let us start our brief discussion and get all your answers. Grow Tent Setup Complete Guide….., T5 Grow Lights For Indoor Gardening…. WHAT ARE GROW LIGHTS AND WHY YOU NEED THEM? Led grow light is an electric light use to grow plants indoors where they cannot receive direct or sufficient sunlight. We all know plants use sunlight for photosynthesis, this is a process used by plants to convert light energy into chemical energy for their living. In simple words we can say they live in sunlight you cannot grow a plant without a light source. Today many people like to grow just for themselves or for their loved ones but they do not have enough land so they choose to grow plants indoor (Greenhouse growing is a suitable example of indoor growing on large scale). Therefore the light manufacturers designed their grow lights in such a way so that they(lights) will become perfect for indoor photosynthesis. There is no any natural occurring light in case of indoor grow lights, they use the same natural light spectrum to emit light similar to natural light. Growers use these man-made artificial growing light where plants or seeds cannot receive natural sunlight. For example, in winter when we do not have enough hours of natural light and also most of the land get covered with snow which makes it difficult for the plant to grow according to their natural process. To overcome this problem researchers develop artificial lights with natural light like a spectrum which is called indoor grow lights or LED grow lights. LED Grow lights emit two different light spectrum, one is similar to sunlight while other is tailored spectrum to meet the light requirements of specific plant species. The use of light totally depends upon the type of plant being cultivated. Factors like lumen/ watt, color temperature, and spectrum decide the efficiency of an LED grow light. 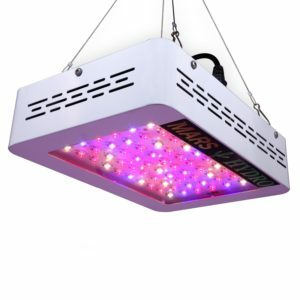 Use of LED Grow lights Canada is growing day by day as the more people like to grow plants, vegetables or other things in their basements or apartments. LED grow lights Canada are used for indoor gardening, vegetable production, growing medicinal plants, and herbs etc. 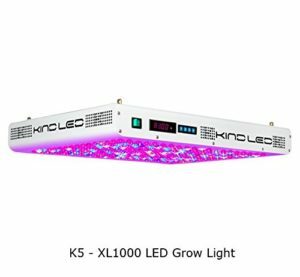 Grow lights are famous in the food industry to increase the production of food in all seasons those are bigger in size with different shapes but they share the same technology as your household led grow lights. You can use them in household growing only if you have a large space to install them. Growing indoor is not an easy process there are many hurdles on this path. The main hurdle is you have to give full light to plants or seeds as much as possible without wasting emitted light. Many techniques are used to make this process more efficient. Light reflectors are a good example of increasing the efficiency of light. One should install lights or put plants close to each other as possible to grow them without any problem to cultivate them on right time with heavy fruit. High-intensity discharge lamps are widely used on the professional level where a large number of Harvest should take place after some time. Fluorescent Grow lights burnt very frequently they do not work well where frequent switching is required and with the increased number of running time their lifetime reduces and need to be replaced them more often which will increase the overall growing cost. This is the big drawback of this old-fashioned technology. Whereas in the case of LED lights you do not need to replace them like fluorescent lamps. LED’s use of light emitting diodes which never burnt and not need to replace them. Several small LED’s are used to make one LED grow Bulb. LED growing lights are made of high-quality plastic and are hard to break mean almost unbreakable. LED grow bulbs consume less energy as compare to other growing lights which lowers your overall production cost and this means more savings each time you grow something. Below are the steps to follow while choosing to grow lights. The area of coverage: Make a clear decision about the space you are going to cover with grow light. This will give the idea of how many grow lights you need to buy and which type (style or shape) you need to buy the most. To cover the large area just use the LED lights adjacent to each other. Growth cycle: It very important to know the growth cycles of your growing plants before seeding them into the pots or shelves. Full spectrum lights are required for full growth. Many advanced lights have ON/OFF switched on the back of lights so that you can easily adjust the spectrum according to the need of plant (veg or blooming). An angle of Lens: Always check the angle of diodes takes a minute to look closer to the diode to check the angle. Remember wider the angle means more coverage. The last point is the price: This is your personal choice how much money you want to spend on your growing light. GROW TENTS: These are an excellent idea to grow plants in a controlled or limited space without disturbing the environment of the house. They are designed to control the smell of soil and fertilizers so that you get clean fresh air inside of your home. You can also protect them from children and give them a nice dark space when they need for rest. Sunglasses: These are designed to protect your eyes from the bright light of Growing Lights. Always wear them before working on LED lights as the direct eye contact can damage your eyes. LIGHT METER: Every grower should use this gadget to measure the quality of light even the small growers can afford it. Nutrients: These are very essential for healthy plant growth otherwise your plants will die before the flowering stage. Make sure to choose branded and quality products when it comes to the feeding of your lovely plants. Inline Duct Fan: These are used to make the Grow room Airy and well ventilated otherwise plants can die due to the lack of oxygen in the room or grow tent. Diamond series is getting popular among indoor growers due to its benefits and perfection of emitted light. It has everything whatever your plant needs to grow healthy. This is one of the best product in its class. American made LED diodes are used in a single chip with the wattage of 10W per LED diode. Which emit nice bright light with 11+ wavelengths of output. This light uses a PAR rating = 1395 and 987 for 18 and 24 inches respectively. Precision Degree XML collimator lens for optimal coverage. It covers the area of 4.5’x 4.5’ effectively. if we roughly cont the number of plants than it will be 15 to 18 plants easily get covered under this light. It has dual heat sinks which reduce the heat emission by the light to the great level as compared to the other lights. Users said they observe the sudden change in the growth of their vegetable and others plant. It makes their growth better a well as speed up the vegetative and blooming stage. It is specially designed for indoor vegetables and plants. This has everything for better growth, the full spectrum gives everything to plants from the very first day of use. 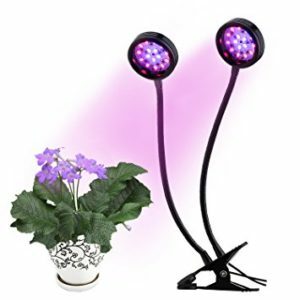 We want to tell you that this is the second biggest seller of grow lights. You can easily find the light of your choice according to your requirements. Use this light to replace 600W HID bulb, this will be a great saving and first step towards advanced technology. It only consumes 269 watts (which means saving of electric bills). Moreover, this light covers 3×3’ vegetative coverage at the distance of 32inches. 2.5×2.5 this is flowering coverage at eh distance of 22inches. Great satisfaction rate with 3 years of manufacturer warranty and 30 days satisfaction or return guarantee. The product is not waterproof so use it carefully while near water or wet surfaces. Keep the surrounding temperature below 40 degrees. Great option to control by the timer. Wear your safety glasses to protect your eyes from bright light. Platinum series is a reliable company making durable grow lights by using all parts made in the USA. There is no doubt in the quality and reliability of these lights only genuine components are used to make each and every light. The company believes in higher customer satisfaction. If diamond series is out of your budget you can choose these ones: Platinum Series P900, P600, and P300. This one of our favorite light. We are using it for 14 months and the results are amazing. Growers will agree that it has the highest PAR/LUMEN output. You can only use it on the 5 to 8 plants as it only covers the area of 2 by 5 feet. Again you will find two switches on one side like other lights Veg and bloom. If you have 800 HPS system our advice is to replace it with this latest technology you will not regret your decision. The product is backed by 5 years of long-term warranty and 90 days of return policy. Complete light spectrum for every type of plant just plug and play technology. 3 watt LEDs are used to give the bright light of right wavelength so that light easily gets enter into the leaves and feed your plants what they are in need of. The platinum series use power fan so that your plants do not get burn ( maximize safety). Now, this is the light for beginners or low budget light but this does not mean it is not effective. Platinum series grow light are all effective with the difference of power. Full spectrum light with two switches as the above one has. UV, IR diodes are integrated on the same panel to give complete food to your plant. Best to replace 400 HPS system (less efficient). a complete light from seedling to harvest. Give the equal amount of power or equally efficient in all stages of growth. All platinum series products have high values of PAR this means the light gives 2 to 3 times more light than the other competitors. Angles of focus at 90 degrees which increases the penetration of light. Excellent piece of advanced engineering, built by using the 90-degree optical lens which increases the absorption of light hence plants get more nutrition. High savings on electric bills as it reduces the loss of light by emitting the light straight on the plants. 380 to 760 nm full spectrum of light this is the wavelength of light normally plants can absorb for photosynthesis. 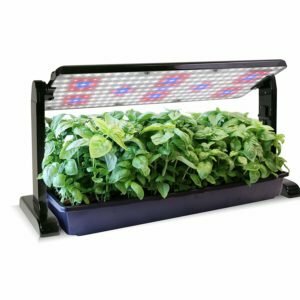 it only needs 400 watts to emit full 1000watts, perfect for the growing area of 4x3feet (to cover this are hand it just above 24 inches of plants). Replace your old HPS with this 100 watt Led light. Backed with 3 years of warranty. High-efficiency light with 3 and 5 watts LED diodes which increases the intensity of light. Most tunes color spectrum of light perfect for vegetables and flowers. The most interesting thing in this light is it has a remote control you do not have to touch the light every time you want to switch between given modes of operation. You can just use the remote control by standing far from light or without entering between your plants and change the mode from veg to bloom or full light. Easily cover the 5×5 feet area, this is fully customized light this means you can adjust it completely according to your needs. Our readers like this product and advise to handle it with care as it is expensive and the only manufacturer which give fully customized light with remote at this price range. 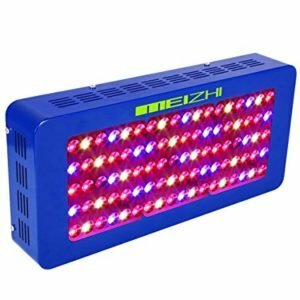 Below are the Cheap grow lights (low budget) in Canada. 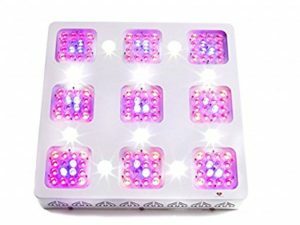 Best LED grow light with a lifespan of more than 50,000 hours. It is equivalent to 1500watt but only consumes 340 watts. A very bright LED growing light with all color diodes, this means it is full spectrum grow light. 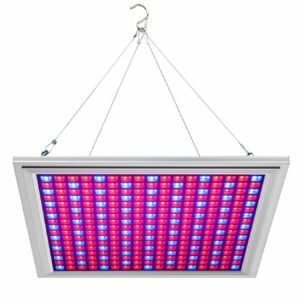 Red, Blue, Orange and White color diodes are mounted on a large chip to emit perfect light for indoor growing. 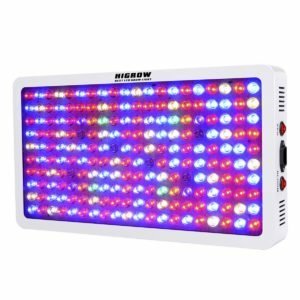 another benefit of morsen 1500 watt grow light is it also emit IR(infrared) light and UV light of different wavelengths but in a limited amount. You do not need to buy extra Red, Blue and Green lights, this full spectrum LED light has 3everything you need for indoor growing plants. The manufacturer uses Zener diodes on a large circuit board with an inbuilt adaptor which adjust the power supply according to the power requirements of internal components. This increases the life cycle of light and also provide more safety of equipment in long hours of operation. ON/OFF button is mounted on back side of light near to the power plug, this makes it easy to turn it ON/OFF without unplugging the cord. It has a high-speed fan to reduce the amount of heat or to cool down the internal system. The package includes one light, free cord, and hanging hooks. Widely used in Greenhouses, Factories, Vegetable farms, Flowering Farms etc. Another hanging LED growing light with rust proof copper metal buckles. Plants need a suitable growing environment for proper growth and if the surroundings are too hot or cold your plant will die in the first stage of growing. The highly efficient cooling system should be installed to avoid excessive heat and give the best suitable environment for plants. The LED emits an extremely bright light which is not suitable for human eyes, so do not try to look directly to the light with naked eyes. Always wear your sunglasses when looking at it this will protect your eyes from getting any damage. The product is not waterproof, so do not use it in damp locations this will cause damage to the internal components. use strong fixtures to fix it. It emits exact wavelength which can be easily absorbed by plants. Technically advanced grow light with 120 degrees reflector panel. It satisfies all your plant needs with its full spectrum light. It has two Infrared diodes which emit dim light but this does not mean they are ineffective in fact they emit very high-quality light which can be easily absorbed by the plants in each stage. This light has two modes of operating one is when your plant is in a vegetative stage another is to promote flowering by turning ON the flower switch. Both modes can be easily controlled through the switches present behind the light. High-quality aluminum made heat skin are there to give constant temperature and cool the light or internal parts of it. Four vents are there to distribute heat in all directions equally. Users said when they make a switch to this product their plants respond immediately. Emits a very bright white color light when both modes are ON. Small size grow lights or supplemental lighting is required to grow in the small area like in small basements or tight rooms. Some growers like to grow in Small quantity for just themselves or they are the first-timers or beginners who do not have much experience, they like to buy just one single light for all stages of the plant. 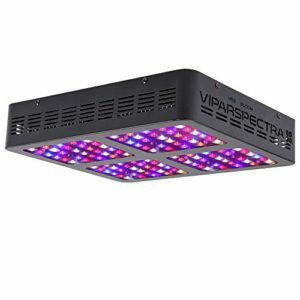 For those growers, we bring special full spectrum lights for compact areas. You do not need to buy more light for each face of growing. Below models of lights are sufficient to give proper nourishment to plants. These are enough for one or two plants. It has more light means more nutrition for your plant to grow healthy and strong. In test conditions, this light shows satisfactory results. Users are happy and 95% of them give positive feedback. Investing in high quality led grow lights is always a better idea where they give superior light at the same time they save your consumption of electricity. Heat emitted by lights or our surrounding put stress on plant growth but this product does not produce heat in large amount so it is safe to use without worrying about heat emission. A small amount of heat generation is normal and this much does not affect your plant. High-quality LEDs are used in the panel to keep the temperature of the panel as low as possible. 60-degree reflector design suitable for every phase of growth. Avoid buying fake and cheap light they are the wastage of money. Buy the latest light for indoor growing. You can place led panel as close as you want, high-quality LEDs are always cool to touch. 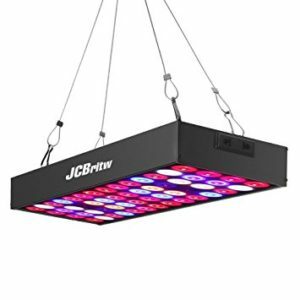 This affordable grow light has 212 Red LEDs plus 77Blue LEDs. This is the need of your plant red and blue to grow strong. Suitable for potatoes, tomatoes, lemons, strawberry etc. The advanced feature gives you the ability to bring it to the full dimmed condition 0 to 100 % dim-able light so that you can adjust for each stage differently. Waterproof light for indoor use it prevents the moisture, mist or fog to enter into the light. High-quality steel is used with the mixture of aluminum to ensure the durability of light in all conditions. 0.5 watt LEDs huge savings on electric bills. Backed by the 2 years warranty and 30 days money back guarantee. Dual mode for veg and bloom stage, the brightness of the light is equal to the two lights of the same wattage. You can easily grow tomatoes, roses, basil, lemon, palm tree etc. This light is equivalent to 100-watt HPS but it only consumes few watts of electricity. For veg mode, it only consumes 17w and 15w for bloom phase. The complete aluminum case which gives it a strong base. 60 degrees reflector cup design is unique in its class and gives the chances of more absorption of light. Hand it to 24 to 28 inches for seedling, 18 to 24 inches for growing and 12 to 16 inches for flowering stage respectively. Glare-free light, in fact, it has the mixture of different color to make the best spectrum for plants to grow faster. It also increases the chances of better photosynthesis in plants. 1-year warranty from the manufacturer + 30 days returns guarantee if not satisfied. One light for a full plant growth beautiful range of 460 nm to 660nm this is the range of wavelength which your plant need for photosynthesis. It has two different heads attached to different shafts with two switches to control each head separately. 2A adapter with USB connector so that you can use the product by using an electric socket. A lifespan of 35,000 hours, maximum power 16 watts which enough for small growing for one or two plants. Do not put too close to the plant it will not increase the light absorption but it will burn your plant for sure. So put it at the minimum distance of 8 inches and maximum of 20 inches. Remember plants also needs rest like us to repair the damage and grow so it off after 10 to 12 hours. Use it carefully in damp conditions a sit is not waterproof. Many people like to eat a plate of fresh salad every day. Lettuce is the best part of every type of salad style. Canadian people are more health conscious then others in the world they like to eat fresh and juicy vegetables. If you are also a fan of lettuce like me then you should start growing your lettuce at your home. Yes, It is possible to grow fresh juicy lettuce indoors. I know we do not have enough sunshine under the roof but you will be surprised to know that your lettuce plant does not need much sunlight. Put it on a window where it can get a continuous natural light for at least 6 hours and if this not possible use best led grow light for lettuce. These are artificial grow lighting system that is used by thousands over the globe to grow vegetable in all seasons. Choosing Best led grow lights for lettuce growing is not an easy job. It is really hard to choose from hundreds of available lights. 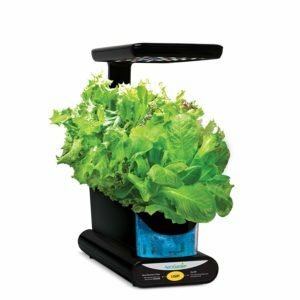 Without proper knowledge and good experience of indoor growing, you cannot find a suitable light that you can use for years to grow your lettuce. The effectiveness of a growing light depends upon many factors like the quality of light, the angle of light, the material of light, number of diodes and color of diodes. We will tell you how this light is different from others. We are using this light to grow lettuce in our basement from last 2 years and believe us this is a topmost rated product in the groups of lettuce growers. You are growing it for yourself and family then the light is a perfect choice. Otherwise, go for other bigger lights with extra features and power. The given light contains red, white and blue light emitting diodes. A red color is suitable for targeting more flowers while blue is good for bigger yield and the third and last white color LEDs are used to grow lettuce at a faster rate. You can use this light on two different styles means, hang it if you have small space or tilt it on its stand if possible for deep penetration of light. Both hanging kit and stand are included do not need to buy them separately. 45 watt led light which is very suitable for growing lettuce and also saves your money by consuming less electric energy. This is the advanced machine used for indoor growing. Three plants can be grown easily and roots are suspended into the water instead of soil. The main benefits are you can use it to grow any type of plant. A perfect combination of grow light and water make your plant healthy and strong. It also has smart features like a reminder. When your plants need more nutrients it will remind you it will turn on the light of the reservoir. 10-watt high-performance light suitable to grow lettuce and other plants. Do not worry about your electric bills it will not consume heavy current, in fact, it is a reliable machine which needs few amps of current and saves your money. HOW TO UPGRADE YOU LIGHTING SYSTEM? LED stands for light emitting diode, many small LED’s are mounted on an electrical chip to make a LED light bulb. These lights come wit in0built fans and heat sink technology. You do not have to rewire your place or change any electrical component use LED’s. just buy a led light and plug it into the existing electrical supply or socket this is that simple. It is a big myth that one should have to rewire the entire place if someone wants to upgrade his or her lighting technology. Many indoor growers think full spectrum lights are not necessary for plants but below are the reasons why we recommend choosing full spectrum led grow lights Canada for vegetable and other plants(flowers). Do not need to buy different lights for all growth stages. Always run cool and comes with integrated cooling fans and heat sinks. Cool to touch while in operation. Before the invention of LED grow lights people use normal fluorescent or High-pressure sodium lights for indoor growing. There were many drawbacks of using these lamps but at that time this was the only available technology. Where LEDs are small in size, fluorescent lights are bigger and not suitable for compact spaces. Because they much equipment to be installed before use, like separate heat sink system, external fans or exhausts. All these need a large area and indoor growers mostly have the small area to grow. Very easy to install based on plug and play phenomena. You do not need to learn anything before installing them and you also do not need an electrician or professional to install them if you already have the power supply in your space. We already mentioned this many times that LED lights comes with proper ventilation system you do not have to install it separately. It is totally up to you how many lights you want an interesting thing is you can install them adjacent to each other. They come in different power ratings so this gives variety to choose. PAR stands for Photosynthetically Active Radiation, it does not tell the power of your light. It shows the usable part of light which means PAR is a range of light between 400 to 700 NM. These wavelengths are used by plants for photosynthesis. Other wavelengths or remaining light gets reflected back by the plants. PAR is divided into two part PPF and PPFD. PPF is flux this shows how many photons are emitted by the light which is usable for plants. PPFD is flux density this shows how much of PAR is actually falls on your plant rather than just telling how much is emitted by the light source. How Many Watts are Right To Choose? Watts does not show the brightness of LED grow lights. It is mention to tell you the power rating of a product means how much power is drawn to the plants. It also tells us how much of the electric consumption will affect their use. WHICH LIGHT SPECTRA IS GOOD FOR YOUR PLANTS? Studies have shown that red, green and blue light spectra give excellent results on plant growth in all phases. Therefore the manufacturers make led with different light color. They come in red, green, blue, white and many other colors. It has been shown that different species need different types of light to grow. But researchers observed that when a plant is placed under both red and blue light it starts growing like it grows in natural sunlight. This means the combination of red and blue grow lights are effective in terms of normal plant growth. White LED grow lights are also extremely beneficial in indoor growing the reason is it provides a full spectrum of light, white light has three different color lights in it. In simple words red, blue and green light make a white LED grow light. So if you have a white grow light this means you have red, green and blue color light whose combination give white color light. This one light will full fill all your needs and it is affordable. Now the distance between the plant and the LED light should be minimum of 10 to 14 inches to prevent leaf damages. Nowadays we have very high power grow light especially in the field of LED grow lights. The longevity of LED grow lights to make them the cost-effective light source. Photomorphogenesis takes place in plants instead of photosynthesis while growing them under the artificial or man-made grow lights. The different spectrum of light is required to grow a plant without any problem at any stage of growth. A LED light contains many different color diodes these types of lights are often called broad-spectrum grow lights. There are many simple grow lights in the market using them is not very beneficial as they only emit single color while plants need different wavelength of lights to grow normally like they grow in natural light outside. Now here comes on thing mind that which light to use or do I have to use multiple lights for indoor growing. The simple answer to this confusion is using best LED grow lights which emit both red and blue color. Many studies have shown that generally, plants need more blue light in their vegetative phase while for flowering they required much red light so this gives an idea to use both these light for efficient growing. This is the reason that you can see the different color of growing light in the market. Some people do not have enough space to install different color lights so to reduce this problem manufacturers take a step forward and make purple color LED light for indoor growing. This color is a combination of blue and red color diodes. It is also easy to use single light instead of using several grow lights. Some of the expensive LED lights produce UV rays and further studies have shown that UV rays have a positive effect on some species of plants. White light is a full spectrum light, it has red, blue and green light diodes. The combination of these three colors gives a bright white color. Normally there is no any serious problem in using white grow lights but using too many of them give problems in many growing stages. It is highly advised to use a few white lights with some red and blue lights to make the environment comfortable and suitable for growing plants without sunlight. This method gives all essential light color to plants for perfect growing in each stage. There is no dought LED’s can grow your plant efficiently, they are the low-cost growing lights. We advise you to choose best LED to grow lights as they give a wide spectrum of light which is very important for the plant to grow perfectly without natural light source, this also maximize your plant growth. Some LED growing lights also produce IR(infrared) light and UV lights but these are little expensive than ordinary grow lights but their longer lifespan and the wide spectrum of colors make them cost-effective and best choice to make. 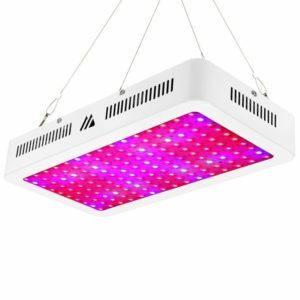 HOW TO CHOOSE A BEST LED GROW LIGHT SUCCESSFULLY? Choosing a best grow light depends on various factors. The area where you want to grow your plants needs to be measured carefully before buying any grow light. It will give you the exact area which you need to be cover with grow lights (so space is an important factor in choosing the best lights). Another factor is sometimes some people like to grow with different light means they do not want to buy an all-purpose light for a vegetative and flowering stage. On the other hand, if you are looking for low maintenance cost lights, LED lights will be your best friend. You do not need to be worried about the lifetime of LEDs as they can run for a year without any trouble.